While history might credit the Germans for the creation of the pretzel, the first American pretzels came on to the scene in the Philadelphia region in the mid 1800's. According to www.ushistory.org: "...Lititz, a city outside of Lancaster in Pennsylvania Dutch country is said to be the birthplace of the American pretzel. Another legend has it that in the late 1850s, a hobo jumped off a train in Lititz and was given a free meal by a baker named Ambrose Roth. In exchange for Roth's munificence, the hobo gave the baker a recipe for the pretzel. 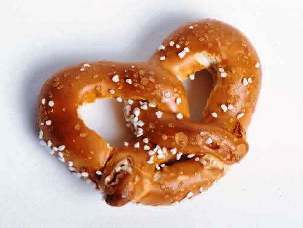 Roth passed on the recipe to his apprentice, William Sturgis, who baked the first American pretzel in 1861...."
Soft pretzels can be purchased throughout the city, often from street vendors. The best pretzel is warm and does not appear to be moist. Once the pretzel gets cold, it begins to harden, and the soft pretzel is no longer soft, nor nearly as good. Most people coat their pretzels with yellow mustard, which heightens the taste. The vendor should have mustard available. Enjoying a Philadelphia soft pretzel is an important experience during any visit to Philadelphia.